For the second time around, I am going to talk about the article the which is non-existent in the Korean language. So what in this world I am writing a note about it again? In the previous post, I shared my own analysis whether the super-four particles (이-가-은-는) could take the place of ‘the’ in Korean. And the answer… can be found here. This time, let's take a look at two phrases which is grammatically incomplete without this article. First, we use 'the' in the superlative form of adjectives as in the easiest, the farthest, and the most interesting. Whether you use the 'adjective + est' form or the 'most + adjective' form, the article 'the' is always present. 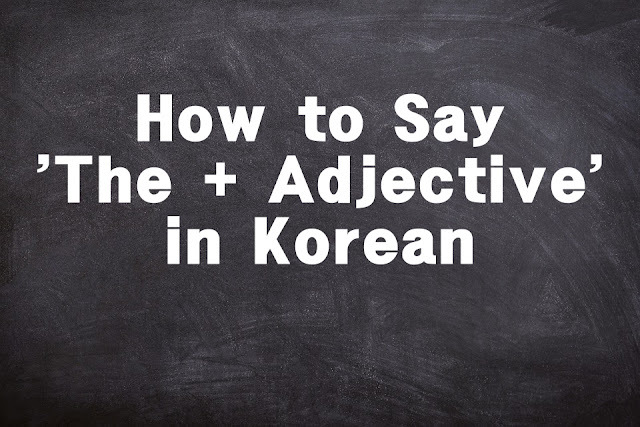 Surprisingly, there are also two ways to change an adjective into its superlative form in Korean- the 가장 + adjective and 제일 + adjective. They good thing is you won't be struggling which one to use since they are primarily interchangeable. In the case where an adjective modifies a noun, we simply add –ㄴ or –은 on the verb stem depending on the final sound. My son is the most handsome. 요즘 드라마들 중에 도깨비가 가장 재미있어. 'Goblin' is the most interesting drama these days. Of course, English is the easiest. 서울은 한국에서 가장 큰 도시예요. Seoul is the largest city in Korea. 그건 내 인생에 가장 어려운 결정이었어. That was the most difficult decision in my life. 6월 21일은 1년 중 낮이 제일 긴 날입니다. Second, we always use 'the' in the expression one of the + noun. It is used to express that something is one among many as in ‘one of the members of’, ‘one of the countries in’, and ‘one of the things that’, etc. Just follow the pattern ‘noun + 중 하나이다’ and you are all set. 미얀마는 동남아시아의 국가 중 하나이다. Myanmar is one of the countries in Southeast Asia. 다현이는 걸 그룹 트와이스 멤버들 중에 하나이다. Dahyun is one of the members of the girl-group Twice. 쿨의 '아로하’는 내가 자주 듣는 것 중 하나이다. The song 'Aloha' of Cool is one of the songs I often listen to. In the second example, 하나이다 can be replaced with 한명이다 since our subject is a person. In the third example, 것 can be replaced with the word 노래 since our subject falls to that category. Now, let's combine 'superlative + adjective' and 'one of the + noun' into one sentence. 세종 대왕은 조선 시대의 가장 훌륭한 왕 중 한명입니다. King Sejong is one of the greatest king of Joseon Era. 민성이는 우리 반에서 가장 똑똑한 학생들 중 한명이다. Minseong is one of the smartest students in my class. 한국말은 여려운데도 세계에서 가장 아름다운 언어 중 하나이다. Korean, though hard, is one of the most beautiful languages in the world.